‘…The nice young Wheelers on Revolutionary Road, the nice young revolutionaries on Wheeler Road…’ (John Givings in ‘Revolutionary Road’). This is not the most famous line from Richard Yates’s critically-acclaimed novel ‘Revolutionary Road’, but one of my favourite ones. The 2008 film adaptation of this novel, directed by Sam Mendes, though deemed by critics as “something way too much coming way too late“, is nevertheless, a brilliant, underrated drama set in the mid-1950s in Connecticut, USA. The film’s plot mirrors the novel’s narrative. April Johnson (Kate Winslet), an aspiring actress, meets Frank Wheeler (Leonardo DiCaprio), an odd-job man. The film then takes us to the end of the debut of “The Lauren Players”, an amateur acting troop, staging Robert E. Sherwood’s play ‘The Petrified Forrest’, also starring April. After the play’s complete fiasco, April and Frank have a “fight”, after which the couple’s relationship deteriorates and Frank has a “fling” with a co-worker. However, after awhile, incapable of leading their boring, meaningless lives in a suburb any longer, the couple decide to go to Paris “to live for good“. Their plan is that April will work in Paris, while Frank will “search for his talent”. Their decision shocks their neighbours and amuses Frank’s work colleagues. As the couple prepare and make plans, they inevitably get closer and become happier. However, the hope for a better life makes Frank a more productive worker, leading to his promotion at work, and because of the personal and financial reasons, Frank is unable to turn the job offer down. Then come the news of April’s pregnancy, meaning that their Paris plan collapses as she is unable to work. This leads yet again to April and Frank’s relationship deterioration, and after another “fight”, April attempts illegal abortion, leading to her death, while Frank becomes a widower and a single parent, stuck in his meaningless office job, perpetually engulfed in guilt. 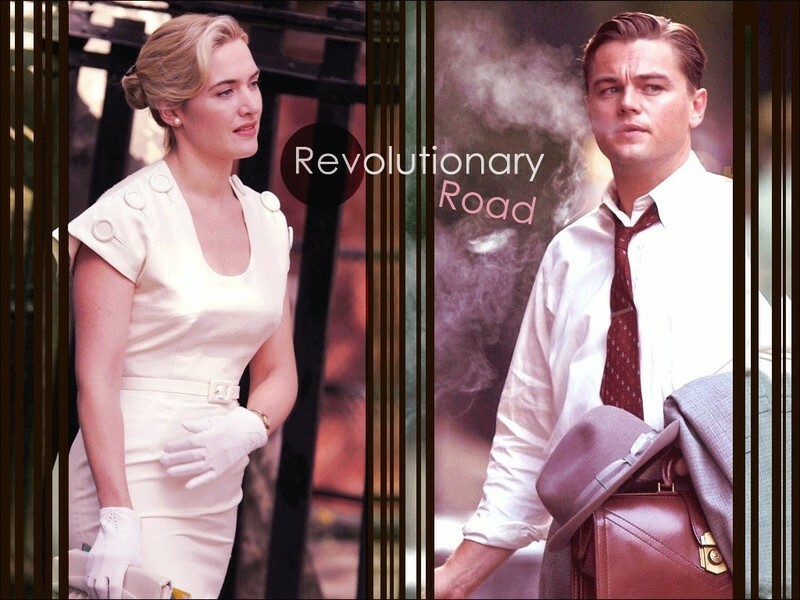 Despite its seemingly straightforward story, ‘Revolutionary Road‘ is deeply moving and heartfelt. Winslet and DiCaprio are mesmerising to watch, as the two re-unite in this movie for the first time since ‘Titanic’ (1997). The “fight” scenes between Winslet and DiCaprio are realistic and emotionally-charged. Each character can be a study in his/her own right, and their relationship is even more so. The Wheelers are indeed “revolutionaries” in a sense, leading “the lives of quiet desperation”. The ambitious couple, feeling themselves superior to people around them, but “stuck” in a boring conformist culture of the 1950s, desire to escape their lives and lead more colourful ones in Paris, where they “can really feel things”. The audience cannot blame them, as they talk of “this whole country being rotten with sentimentality” and “hopeless emptiness” of their day-to-day existence. The film, as the book, creates this desire to genuinely sympathise with the couple, portraying the latter as brave people who are unafraid to break everyday stereotypes, and live the lives their truly want. ‘Revolutionary Road‘ is a movie about many things, but especially about disillusion, hopelessness and despair that sometimes knocks on everyone’s door. The Wheelers become disillusioned with each other; their lives; with the whole concept of the “American Dream”; and then, eventually, with their hopes for a better life. What is so fascinating about the novel/film is that, although the Wheelers seem to be the main characters, other characters are also getting their fair share of spotlight, so that the audience/reader “roots” for them too. The Wheelers’ neighbours – Helen Givings, a real-estate broker, her son John, and the Campbells – Shep and Milly, are not just “accessories” to the story and to the main drama, but have their own life stories, feelings and points of view to be expressed. For example, in the book/film, Shep Campbell’s secret love for April Wheeler is well-portrayed. For example, in one scene, Shep breaks down in hospital at the news of April’s state; and there is also a scene where he tells his wife that he does “not want to talk about the Wheelers any more“, seemingly cherishing his “happy” memories of April. Kathy Bates is amazing as Helen Givings, a nosy, bubbly woman who arranged the buying of April and Frank’s house. Her son John, played brilliantly by Michael Shannon, is a mentally unstable “intellectual” who, while visiting the Wheelers, speaks his mind and seems to know what April and Frank really feel and think. In fact, John is being the story’s “conscience”, saying the “unsaid” – the “naked” truth. He, like April and Frank, is “a seer in the world of the blind”. The fact that John is mentally unstable, and the Wheelers understand him so well and associate with them instantly, only shows how socially isolated the couple feel deep inside. Then, there is Jack Ordway (Dylan Baker), Frank’s co-worker. “An office entertainer, a clown and a drunkard“, Ordway brings laughter to the boring office atmosphere. However, Ordway also symbolises the “reality” which constantly mocks Frank and his attempts at leading the fantasy life he wants. Although the film does not convey the whole atmosphere of hopelessness and desperation endured by the main characters in the book, the film remains true to the novel’s main idea/essence. In some instances where the film is deficient, e.g., could not follow Frank’s trail of thoughts, music and actors’ facial expressions provide compensation. Even so, arguably, some scenes in the novel should have been included in the film; for example, the scene in the novel where Frank rushes out of a conference room upon hearing about April’s incident, because this is one of the pivotal moments in the novel. Also, the film’s ending could have been better dramatised. Helen Givings, who once “worshipped” the Wheelers, turns away from them in the end, criticising them. It is well-depicted in the film, where she says that the Wheelers have always been “too whimsical” for her taste, “too neurotic”. However, the director (scriptwriter) could have gone a step further, and included Mrs. Givings saying: “Do you know what I came across in the cellar? All dead and dried out? I came across an enormous box of sedum plantings that I must have spent an entire day collecting for them last spring”. The reader here immediately knows what Mrs. Givings is talking about, and they also know the circumstances which led the Wheelers to disregard the “present”. This comment of Mrs Givings provokes a sense of great injustice committed against Frank and April. They are pitied by the reader because the couple does not deserve so harsh a criticism. Regarding the film’s choice of music, the score composed by Thomas Newman fits the picture perfectly: it is both beautiful and eerie. The film itself opens with the song “The Gypsy” performed by the Inks Spots, very popular in the US in the early 1950s. This is a superb choice for an entry song because the lyrics of that song resemble the circumstances the movie characters are yet to undergo in the movie, i.e., their initial ignorant bliss and their bumpy “slide” into the harsh realities of life. “The Gypsy” is a song about a young man who hopes that his lover is not cheating on him, even though he knows well that this is what is happening. As to any real criticisms, although Frank’s feelings and memories are well-documented in the novel, there is this inability to convey them to the screen and they are not given much attention in the film. This is a real pity, because they are very important in dramatising and preparing/leading the audience to the disastrous ending. Frank, feeling rather mediocre and being “haunted” by numerous small depressions, is trying to find his place in life, but failing. In the novel, Frank’s turbulent relationship with his father, as well as his career and love disappointments all add up and lead to the “breakdown” ending. In the novel, it is Frank who depicts his powerful obsession with April; and how “naturally” their love blossomed, constantly remembering his favourite line by April: “Frank, you are the most interesting person I’ve ever met”. To go from this idyllic setting to him hearing of his wife’s indifference is a complete blow. Also, although Kate Winslet is perfect in her role of April Wheeler (mature and strong), there are some serious doubts as to whether Leonardo DiCaprio is really suited to portray Frank Wheeler. Frank Wheeler gives an impression to be an individual with “darker” features and a more complex personality than DiCaprio could master on screen. Though Frank is at times immature and emotionally weak (DiCaprio’s often-played card), he is also adulterous and very playful (not really fitting DiCaprio’s image at all). However, giving the great on-screen chemistry between DiCaprio and Winslet, as it is seen in ‘Titanic’, DiCaprio’s cast is not such a big disappointment.